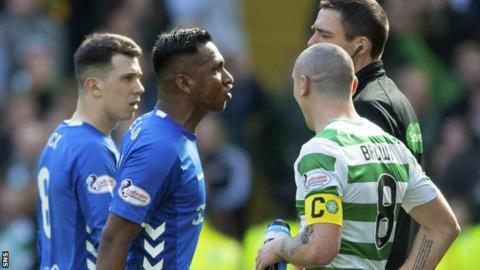 Alfredo Morelos has apologised for the red card in Rangers' 2-1 defeat at Celtic on Sunday that will cost the striker a four-game ban. The Colombian was dismissed for an elbow on Scott Brown and is suspended for two matches plus an additional two given previous sendings-off. Morelos posted a message on Twitter, apologising to "the fans, my team-mates and coaching staff". Morelos has been red-carded five times this season, with one rescinded. The 22-year-old will now miss more than half of Rangers' seven remaining Scottish Premiership games. "I promise to do everything in my power to ensure nothing like that happens again," his statement added. Andy Halliday will serve a one-match ban for his dismissal against Celtic. The 27-year-old midfielder, who was playing at left-back, received a second yellow card after the final whistle for a clash with Brown, who was celebrating in front of the away fans, which sparked a melee. Ryan Kent, who scored Rangers' equaliser, will find out on Tuesday if he faces retrospective action for shoving Brown after Celtic's winner.